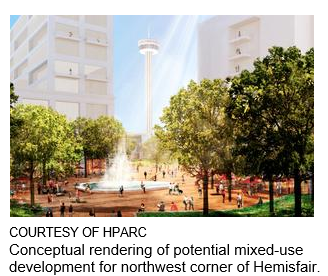 ​​SAN ANTONIO - The Hemisfair Park Area Redevelopment Corporation has made the proposal submitted by Zachry Hospitality LLC and The NRP Group its top choice and will now take the next step toward finalizing the urban park's second public-private partnership. The joint proposal from the two San Antonio firms would be to develop two parcels encompassing five acres in the northwest quadrant of the park—right at the corner of South Alamo and South Market—with the potential uses included new shops, restaurants and 380 residential units next to approximately nine acres of green space. For now, Zachry and NRP will enter into negotiations with HPARC, and approval of a final development agreement is expected to be made sometime later this year.